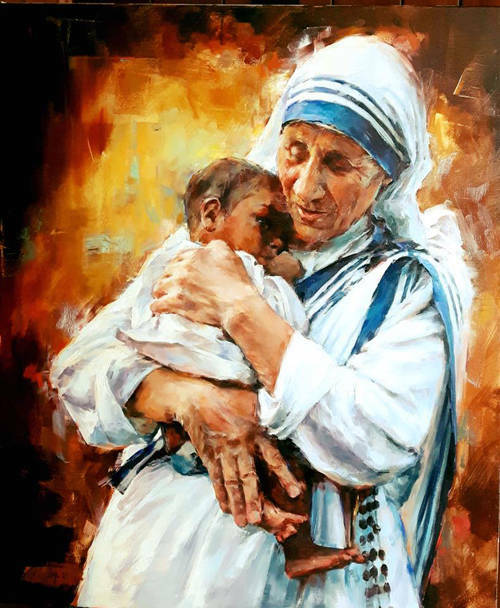 A painting of Mother Teresa by Patricia Bellerose is an example of the art in The Malhotra Collection at the Maria Stein Shrine of the Holy Relics. MARIA STEIN – From June through December, the Maria Stein Shrine of the Holy Relics will host a special art exhibit honoring Mother Teresa, The Malhotra Collection. This collection is from the Museum of Spiritual Art, which is the private art collection of Ramesh and Chris Malhotra located in Franklin. The artworks on display are by local artists and from across the globe, showing paintings and artifacts of the world’s different religions. “The beauty of Mother Teresa is that when she was alive she served the children of India who needed help. After her death she is forever in the future as an immortal soul and will continue to serve as a guiding light for all humanity. We are excited to share this collection of work, highlighting her beauty and devoted compassion to others, with the pilgrims and visitors to Maria Stein Shrine,” Ramesh Malhotra said. The exhibit will feature work from International Artists and Tim Langenderfer of Saints & Blesseds. The exhibit will be located on the third floor and in the newly renovated Upper Room. “We are delighted to be able to exhibit this incredible collection of religious art at the Shrine. The Church has played an important role in, and has supported, the arts for ages. Works of art are one way our spirituality is conveyed. Our hope is many will benefit from viewing this exceptional exhibit,” Shrine President Don Rosenbeck said. The Maria Stein Shrine of the Holy Relics provides faith nourishment and spiritual renewal through opportunities for prayer and pilgrimage and inspiration from the lives of the saints. People from around the world visit the shrine to explore and enjoy this environment rich in holiness and history. The Shrine is located at 2291 St. John’s Road in Maria Stein. For more event information, visit www.mariasteinshrine.org.